MS Word Repair Tool of Your Choice! MS Word repair solution becomes the requirement in situation when the document start exhibiting unexpected behavior like inaccurate formatting of the document, text being unreadable, error messages on screen, unable to load or view content of the file etc which are basically not the part of application programming. To recover Word DOC file under such situations, get our Word Recovery software that is built-up with advance techniques to fix corruption issues. The software is a brilliant creation that helps in retrieval of DOC data with no hassle involved. 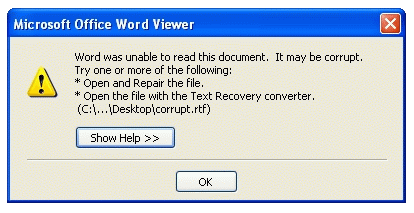 The MS Word repair tool by our company specializes in fixing corruptness error messages that makes data inaccessible. The reason behind this error message can be incorrect information of characters or missing shapes or textboxes. To resolve this error message, an eminent solution like our MS Word repair tool can cater proficient help. The software can be availed in three different licenses to ease the investment process and get the solution as pre requirement.